Danish practice 3XN has unveiled plans for a new aquatics centre in the southern Swedish city of Linköping, which will featuring undulating timber and glass facades. The Copenhagen-based studio won a contest to design the centre, seeing off competition from more than 40 entrants, including finalists Zaha Hadid Architects, Erséus Arkitekter, Henning Larsen Architects and Liljewall Arkitekter. 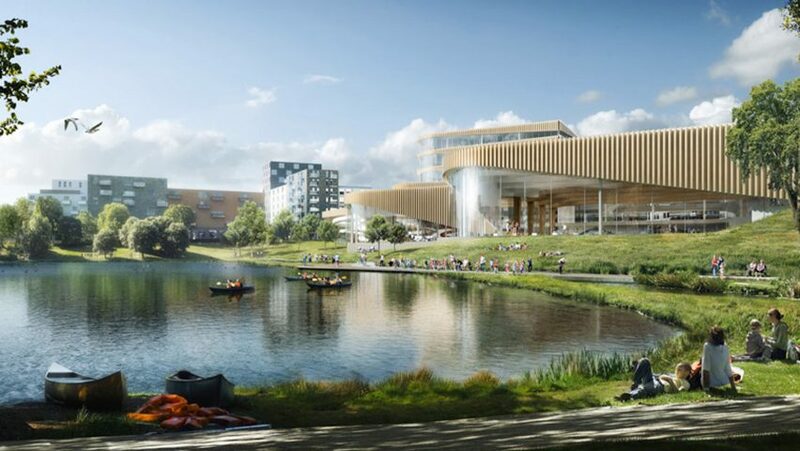 The centre, named Vågen (The Wave), will host an indoor swimming pool as well as offices and a restaurant on a site overlooking a pool of water. An undulating wooden facade will descend over the glazed base of the €80-million (£68-million) centre, framing views out onto the water. The wooden construction is designed to be waste free. "We envisioned a building where the architecture gives hints of its functionality," said 3XN founder Kim Herforth Nielsen. "The waveform in the facade as well as the large panoramic windows blur the boundary between pools inside and lake outside." "The architecture takes clues from waves washing ashore – the curves of the building appear as if they were shaped by the forces of the ocean, eroded over time – a transfusion of the nature adjacent to the site." A tower to the back of the site will contain housing and offices, while lower blocks placed closest to the water's edge host the pool. The 24,000-square-metre project will also include a new plaza with restaurants located by the entrance to the aquatics centre. The centre will contain four different pool areas. Work is expected to begin on Vågen later this year and is slated for completion in 2021. 3XN previously designed an undulating headquarters for the International Olympic Committee in Lausanne and a skyscraper overlooking the Sydney Opera House.